I’m pleased to have work as part of this exhibition at the Centre for Photography and Film in Singapore, as part of the EverydayClimateChange outreach programme. Please find all the details you need below if you are in Singapore and able to visit the exhibition. EverydayClimateChange is an Instagram feed where photographers from all over the world have posted images regarding climate change. As these photographers are diverse and have different cultures, the assortment of images gathered reflects these varying perspectives. The photographs chosen illustrate the causes and effects of everyday climate change, and possible solutions that different communities are undertaking. The Instagram feed was founded by James Whitlow Delano. The exhibition made possible with the support of Yale-NUS College. EverydayClimateChange photographers live on 6 continents and share photographs made on 7 continents to present visual evidence that climate change doesn’t just happen “over there” but that climate change is also happening “right here”. Photography is most powerful when it can communicate deeper meaning by freezing transience. No other medium can better reveal deeper truths, than a camera can in the hands of someone who understands its unique potential. A fisherman carries bags of mussels, recently caught in the bay off of Jakarta. As a result of severe levels of water pollution in the bay, the mussels are now laced with toxins. Many fisherman being unable to sell seafood, resulting in large amounts of unemployment and continued health concerns. A fisherman carries bags of mussels, recently caught in the bay off of Jakarta. As a result of severe levels of water pollution in the bay, the mussels are now laced with toxins. Many fisherman being unable to sell seafood, resulting in large amounts of unemployment and continued health concerns. 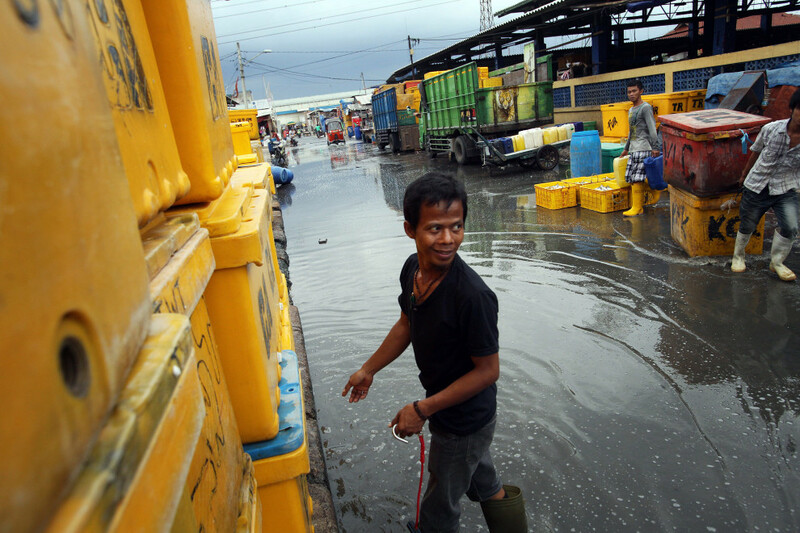 An Indonesian fisherman stands in a flooded area of Jakarta's port. An Indonesian fisherman stands in a flooded area of Jakarta's port. 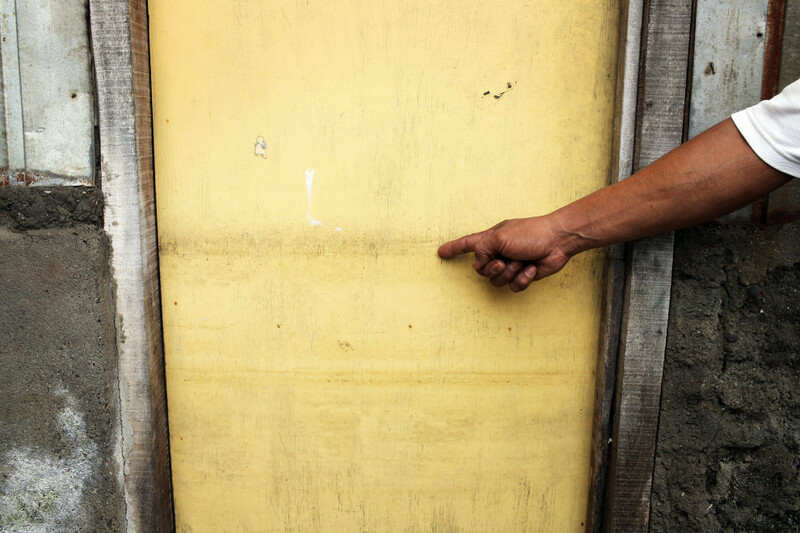 A man points to a line left during high tide in the recent floods in a community in Kampung Apung, in west Jakarta. 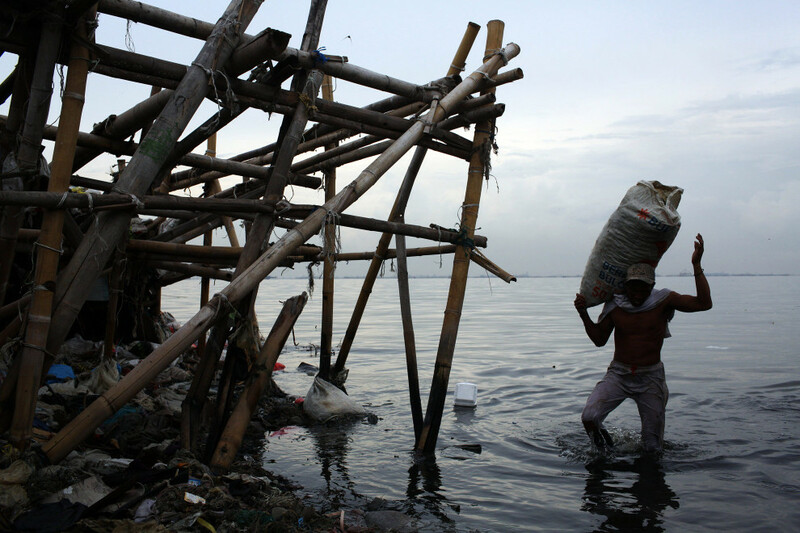 A man points to a line left during high tide in the recent floods in a community in Kampung Apung, in west Jakarta. 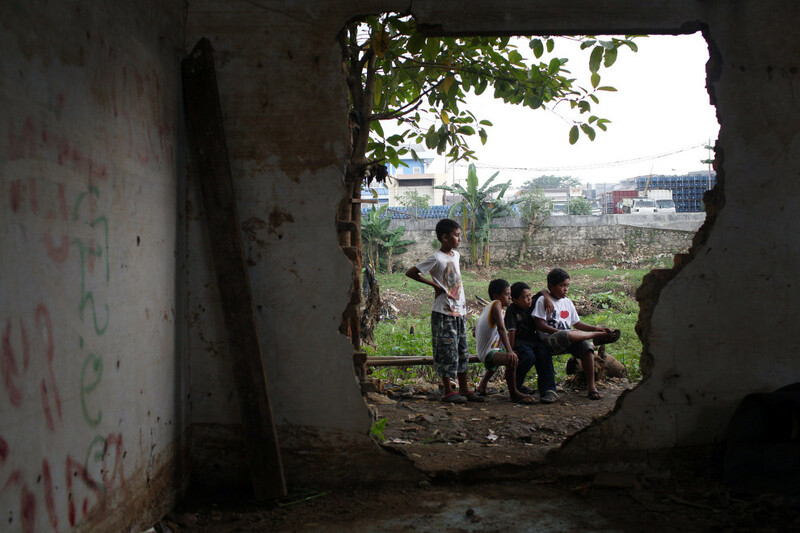 A boy looks out onto a destroyed home in one of the slum communities in central Jakarta. It was destroyed during the January floods which displaced approximately 20,000 people. 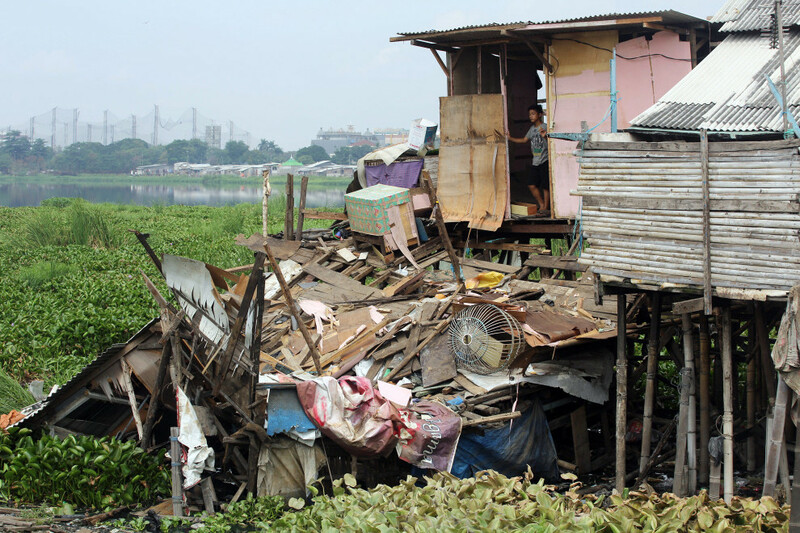 The slum communities are at great risk as many of them are found lining the city’s waterways making them extremely vulnerable to flooding. A boy looks out onto a destroyed home in one of the slum communities in central Jakarta. It was destroyed during the January floods which displaced approximately 20,000 people. The slum communities are at great risk as many of them are found lining the city’s waterways making them extremely vulnerable to flooding. A small passenger bat crosses a canal in the main urban area of Jakarta. The canals were originally built to help the city cope with flooding however they have fallen into disrepair and are now clogged with refuse and human waste that is discarded into the waterway. A small passenger bat crosses a canal in the main urban area of Jakarta. The canals were originally built to help the city cope with flooding however they have fallen into disrepair and are now clogged with refuse and human waste that is discarded into the waterway. A man walks past a river that has been covered with refuse in a slum community in Muara Baru. 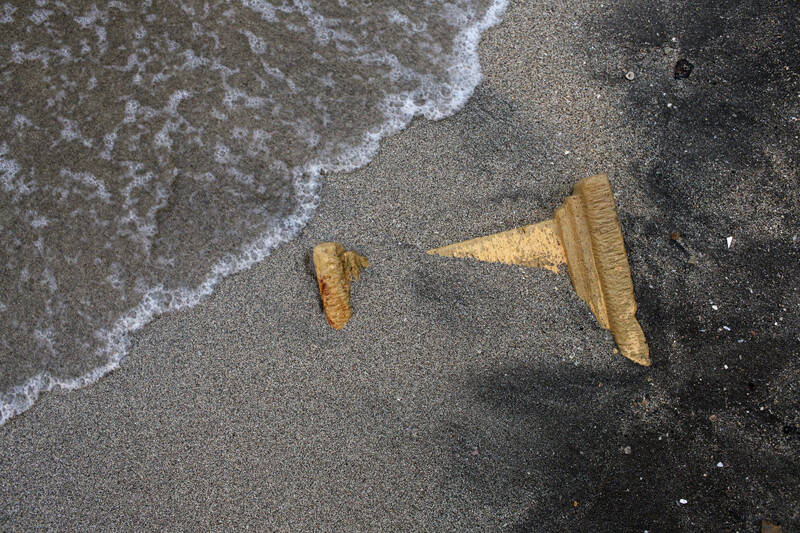 Water pollution is prevalent throughout the city as local residents discard household waste directly into the city’s waterways. Floods also wash large large amounts of refuse into communities, completely blocking the flow of water. 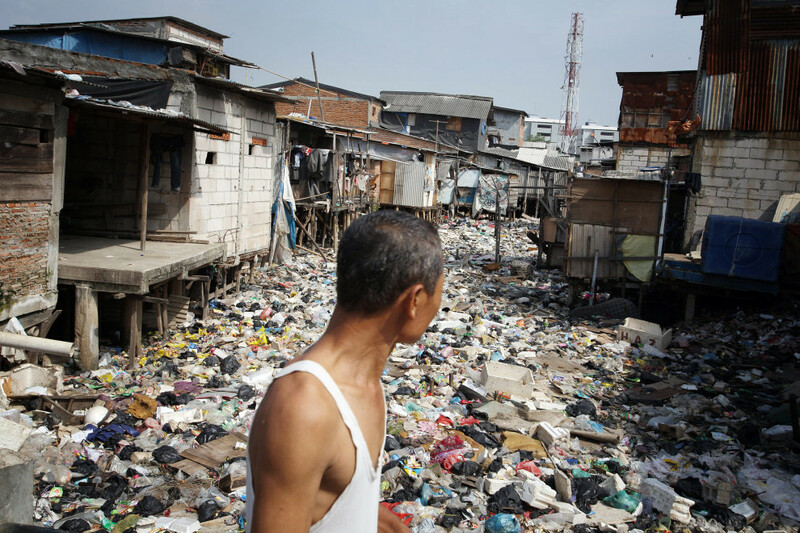 A man walks past a river that has been covered with refuse in a slum community in Muara Baru. Water pollution is prevalent throughout the city as local residents discard household waste directly into the city’s waterways. Floods also wash large large amounts of refuse into communities, completely blocking the flow of water. An Indonesian woman washes dishes in a slum community on the edge of a polluted reservoir in northern Jakarta. It is estimated over 25% of Indonesians live in slum areas, with more than 5 million people living in slum areas in the greater Jakarta area. 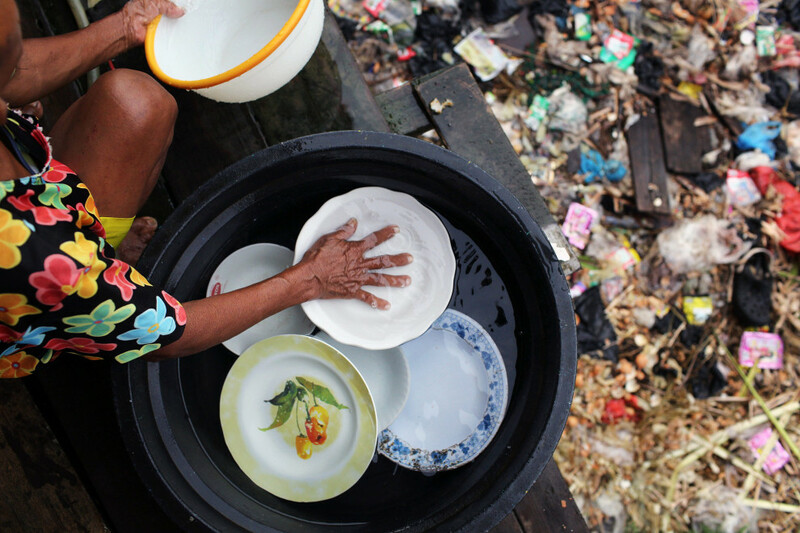 An Indonesian woman washes dishes in a slum community on the edge of a polluted reservoir in northern Jakarta. It is estimated over 25% of Indonesians live in slum areas, with more than 5 million people living in slum areas in the greater Jakarta area. A woman washes herself in the Ciliwung River, a waterway that has been described as one of the most polluted rivers in the world. The river often floods, breaking its banks sending its polluted water into the nearby communities. A woman washes herself in the Ciliwung River, a waterway that has been described as one of the most polluted rivers in the world. The river often floods, breaking its banks sending its polluted water into the nearby communities. A fisherman waves away flies from his recent catch of fish in the mangroves of north-west Jakarta. 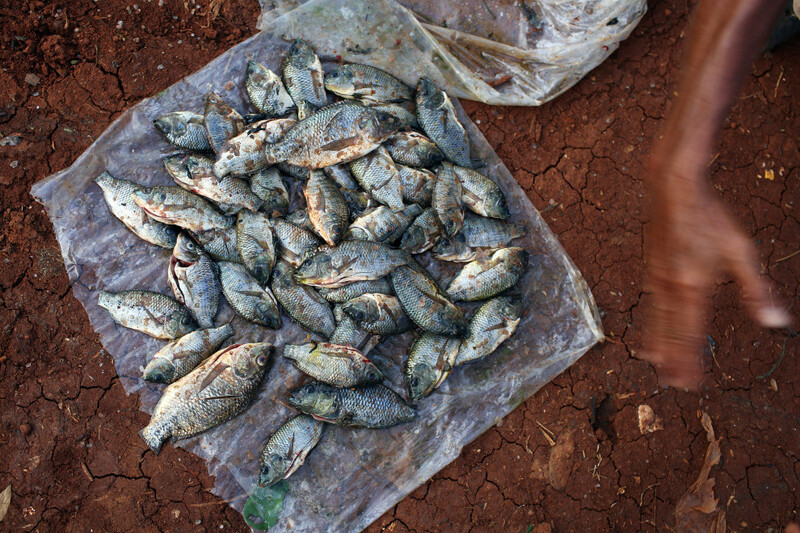 Much of the city's seafood is hazardous to eat as severe water pollution has led to contamination in the food chain. A fisherman waves away flies from his recent catch of fish in the mangroves of north-west Jakarta. Much of the city's seafood is hazardous to eat as severe water pollution has led to contamination in the food chain. 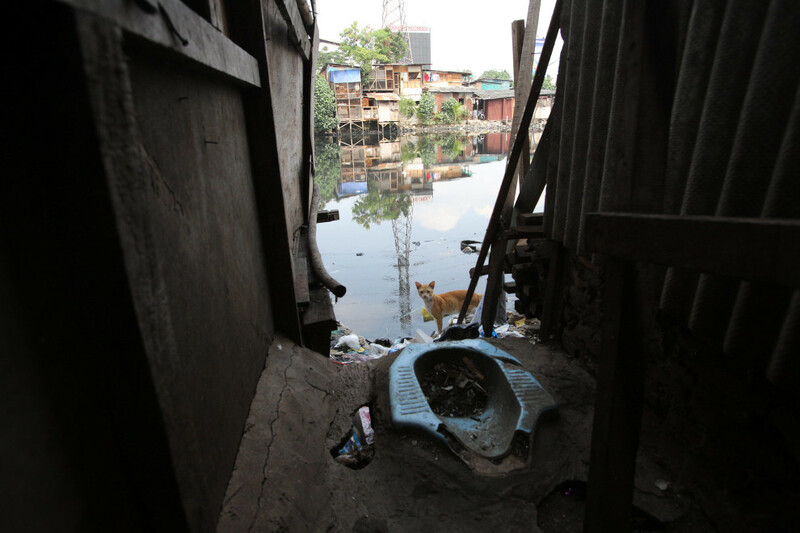 Many toilets in Jakarta feed directly into the city's waterways, resulting in risks to the health of local populations in the area. Many toilets in Jakarta feed directly into the city's waterways, resulting in risks to the health of local populations in the area. A government worker collects trash from a polluted drainage channel in central Jakarta. 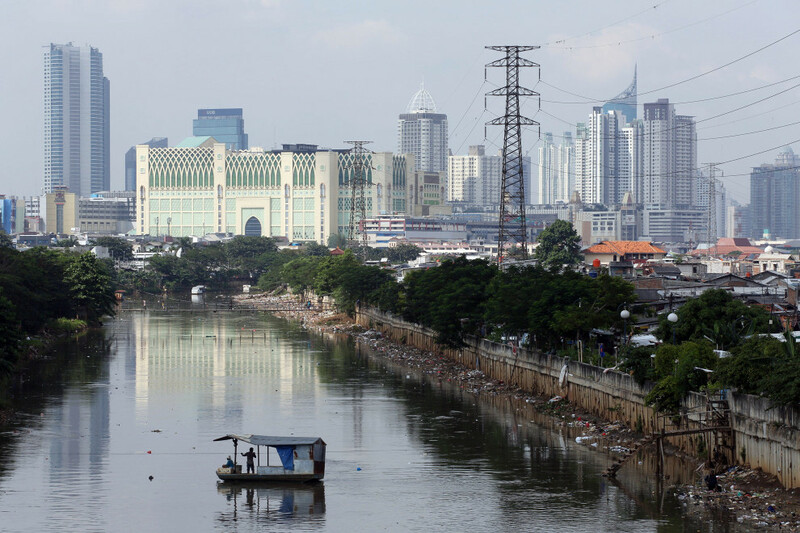 The city’s waterways are all heavily polluted and were recently listed as some of the worst in Asia by the Association of Southeast Asian Nations. 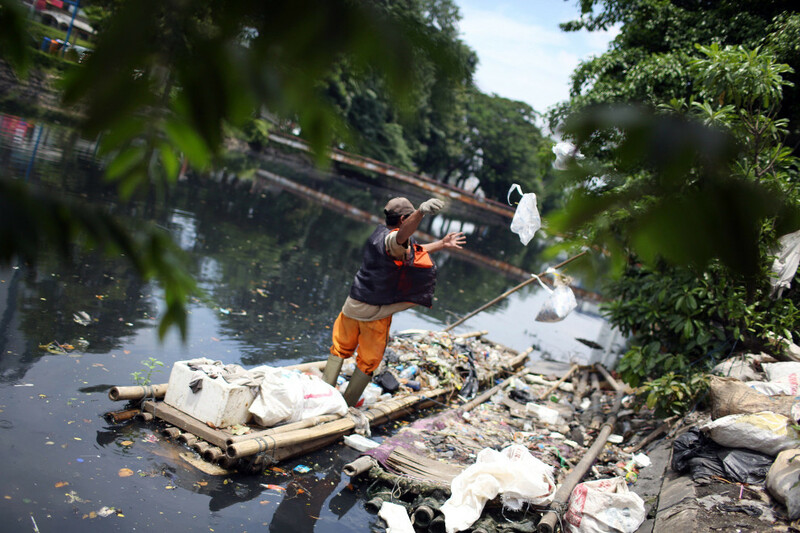 A government worker collects trash from a polluted drainage channel in central Jakarta. The city’s waterways are all heavily polluted and were recently listed as some of the worst in Asia by the Association of Southeast Asian Nations. 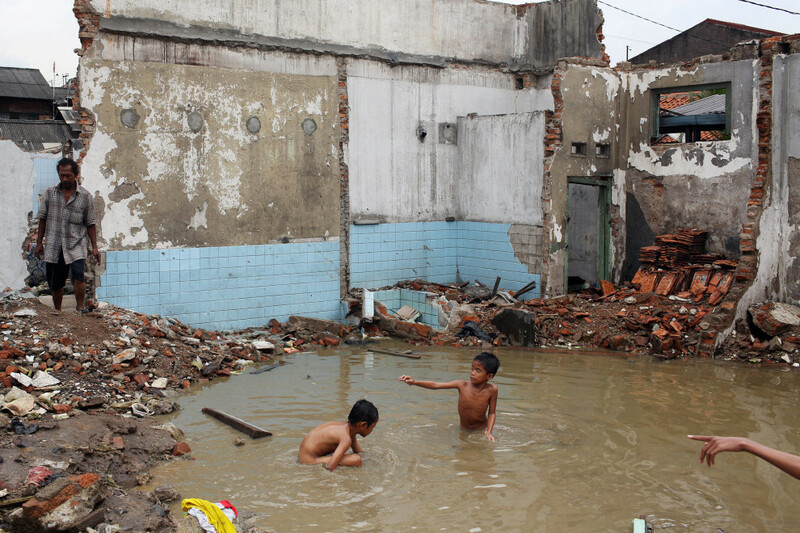 Children play in the remains of an abandoned building in a flooded district in the northern port area of Jakarta. Almost 40% of Jakarta lies below sea-level leading to flooding in many areas, even during the dry season. Children play in the remains of an abandoned building in a flooded district in the northern port area of Jakarta. Almost 40% of Jakarta lies below sea-level leading to flooding in many areas, even during the dry season. A group of your boys gather outside an abandoned building in central Jakarta. Numerous buildings are found abandoned on the banks of the city's 13 rivers, as people flee the regular floods that engulf homes and communities throughout the city. A group of your boys gather outside an abandoned building in central Jakarta. Numerous buildings are found abandoned on the banks of the city's 13 rivers, as people flee the regular floods that engulf homes and communities throughout the city. 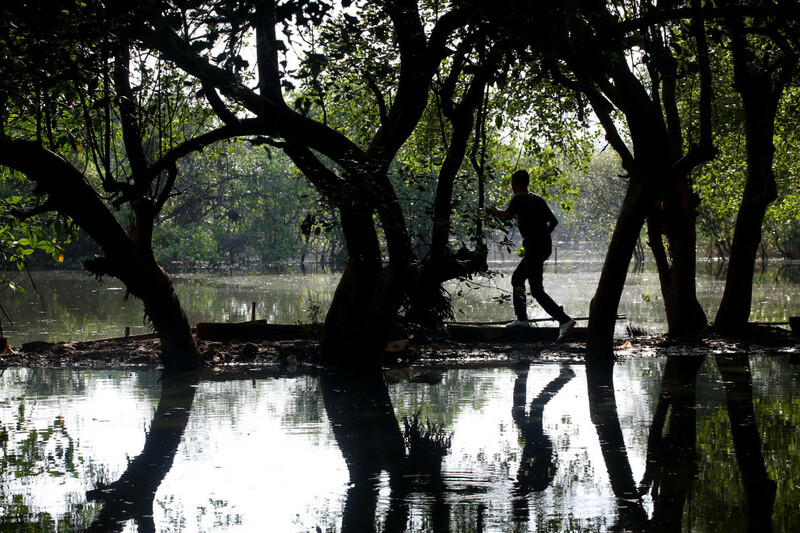 A man walks through a mangrove forest in the north-west of Jakarta. According to the Jakarta Post, "it is now only a matter of time before mangroves are totally erased from the map of Jakarta — a victim of unbridled urbanization and industrialization programs initiated by the government". A man walks through a mangrove forest in the north-west of Jakarta. According to the Jakarta Post, "it is now only a matter of time before mangroves are totally erased from the map of Jakarta — a victim of unbridled urbanization and industrialization programs initiated by the government". A worker carries a recently cut piece of timber near the shores of a reservoir in northern Jakarta. Trees are being cleared to enable to the expansion and dredging of the reservoir which is choked with pollution. It is hoped that this will help ease flooding in the local area. 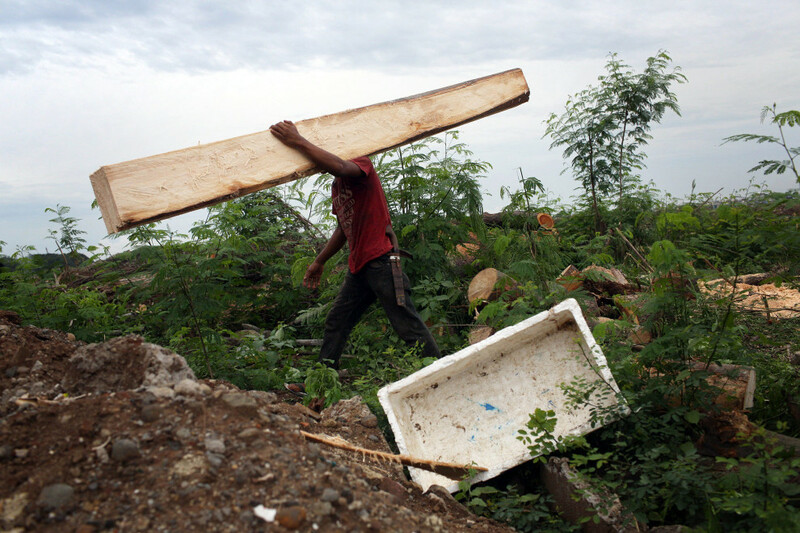 A worker carries a recently cut piece of timber near the shores of a reservoir in northern Jakarta. Trees are being cleared to enable to the expansion and dredging of the reservoir which is choked with pollution. It is hoped that this will help ease flooding in the local area. A piece of a building is slowly engulfed by the sand and sea in the port area of northern Jakarta. Rising sea-levels are a continuing threat, exacerbating the city's many environmental and social problems. A piece of a building is slowly engulfed by the sand and sea in the port area of northern Jakarta. Rising sea-levels are a continuing threat, exacerbating the city's many environmental and social problems. A schoolgirl waits for a boat in a slum community in central Jakarta. Many of the city's poorest residents live just inches above the waterline throughout the city. A schoolgirl waits for a boat in a slum community in central Jakarta. Many of the city's poorest residents live just inches above the waterline throughout the city. Children walk through ruins of a flooded district in the northern port area of Jakarta. Almost 40% of Jakarta lies below sea-level leading to flooding in many areas, even during the dry season. Children walk through ruins of a flooded district in the northern port area of Jakarta. Almost 40% of Jakarta lies below sea-level leading to flooding in many areas, even during the dry season. People swim in a water park in northern Jakarta. Many richer communities in the city have been accused of distancing themselves of the problems faced by the residents of poorer communities, who are the first to feel the effects of flooding and the subsequent social and health problems. 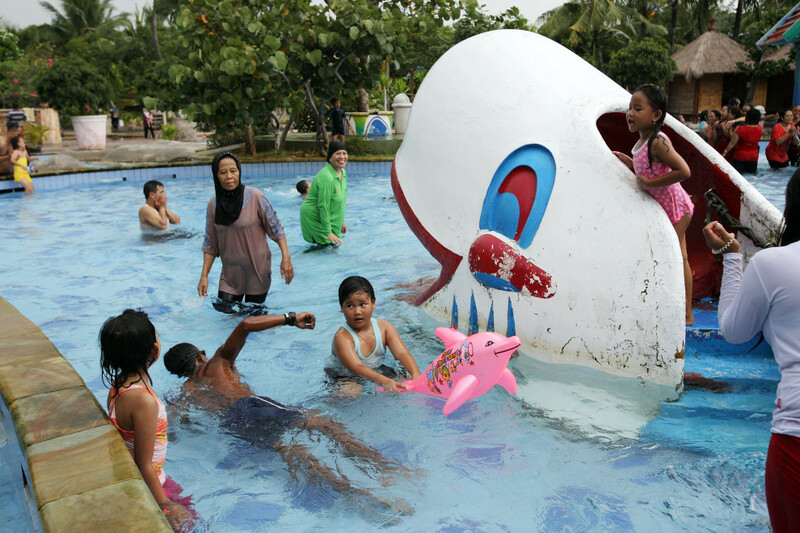 People swim in a water park in northern Jakarta. Many richer communities in the city have been accused of distancing themselves of the problems faced by the residents of poorer communities, who are the first to feel the effects of flooding and the subsequent social and health problems. 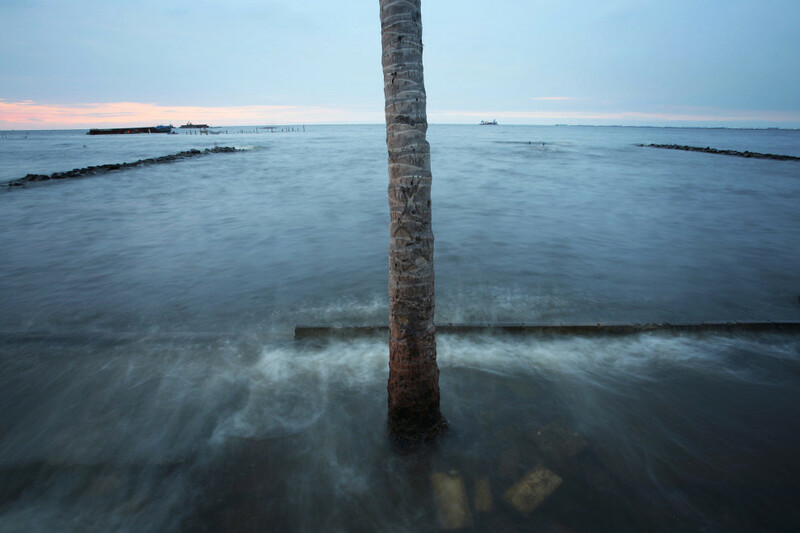 Waves engulf a tree on the north coast of Jakarta. 40% of the city is now below sea-level and with rising sea-levels more and more areas of the city are flooding. Waves engulf a tree on the north coast of Jakarta. 40% of the city is now below sea-level and with rising sea-levels more and more areas of the city are flooding. ECC is not a western view on climate change. Photographers come from the north, the south; the east and the west; and are as diverse as the cultures in which we were all raised. ECC presents the work of committed, enlightened photographers who share back stories, contextualizing not only the effects of climate change but also potential solutions to mitigate the effects of greenhouse gases on our world. The photographs peel back the visual layers and look more closely at the visual evidence.